TThe custom engraved Flare Pilsner features flared sides and a thick base for the classic look a tall, traditional beer pilsner. 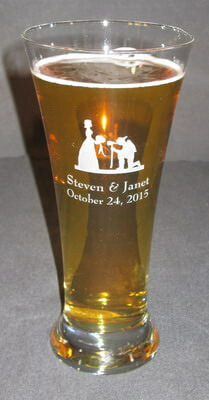 An appealing personalized beer glass, the tapered design draws flavors and aromas to the top of the glass while maintaining the head of your beer. The custom Flared Pilsner is fully customizable from front to back with your choice of personalized text, professional logo, or custom artwork, for a gift or for yourself! The Flared Pilsner is 8 inches tall and holds 19.25 ounces. Personalization, text and/or design, on the front of the pilsner is free, other options are available for an additional fee. We suggest keeping your text to 4 lines of 15 characters per line, it is okay to go over, it may just be smaller to fit it on the glass.